Camp Chef Cast Iron Conditioner, 6 ozs. The best way to "season" cast iron! Recommended by world champion Dutch oven chefs, Camp Chefs conditioner is the best way to season your cast iron Dutch ovens, grill grates, griddles, skillets or other cast iron products. Made of all natural oils, this conditioner creates a natural, easy release surface and should not be viewed as a chemical non-stick coating. Seasoning your cast iron will allow it to last for generations. More good news about this top conditioner! Cast iron conditioner is temperature sensitive. In cooler temperatures, conditioner may thicken. To soften it, simply massage the conditioner tube or set tube in warm water. In warmer temperatures, conditioner may thin out. If this happens open the conditioner with the lid pointed down, as the conditioner may run out rapidly. If the bottle ever develops a clog use a small nail, wire or something similar to dislodge it. 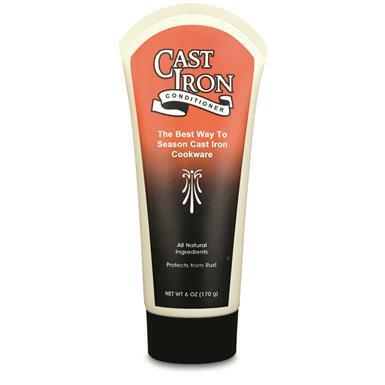 Camp Chef Cast Iron Conditioner, 6 ozs. is rated 4.5 out of 5 by 8. Rated 5 out of 5 by Ron G from Good stuff works well. I had some cast iron cook wear in storage for at least 5 years, which was real dirty and started to turn brown. I followed the cleaning and application instructions on the tube of Camp Chef Cast Iron conditioner, and to my surprise they all look like the had been used for years. Good stuff I’ll buy more this summer when we start going out on camping trips. Rated 4 out of 5 by TROY BOY from Keeps like new Simple to use and doesn't take much time to keep your cast iron looking like new. Even brought back to life some old cast iron I had, that I thought was ruined from improper cleaning and it got rusty. Rated 5 out of 5 by Tyler2 from Best ever! I use this every time I use my cast iron, which is often, and have found nothing better! Yes, you can use liquid vegetable oils, but they leave a sticky residue and can become rancid. Propellent sprays leave the same stickiness and they have, oh yeah, propellents! I do not think this should be "as thin as cooking oil" it is a creamy consistency. If it separates, the "oil" comes out first. I find that I usually have to knead the tube a little before use to insure it's proper consistency-no big deal. I'm guessing this is due to temperature and the fact that this is a natural product. I use my cast iron for everything, especially eggs, as they never stick, with this conditioner. Far better than my over-priced "ceramic" coated pans that virtually everything sticks too! Rated 5 out of 5 by Anonymous from great for storage I find vegetable oil gets sticky during storage and has an off odor. This product is better if you only use a pan or tool occasionally and store otherwise. heat up the pan and rub a little on it will be ready for next use. Rated 5 out of 5 by Ivan from Thin as cooking oil I dont know what the other reviewers problem is where he cant get it out of the bottle but this stuff is as thin as a cooking oil. it is a must have.